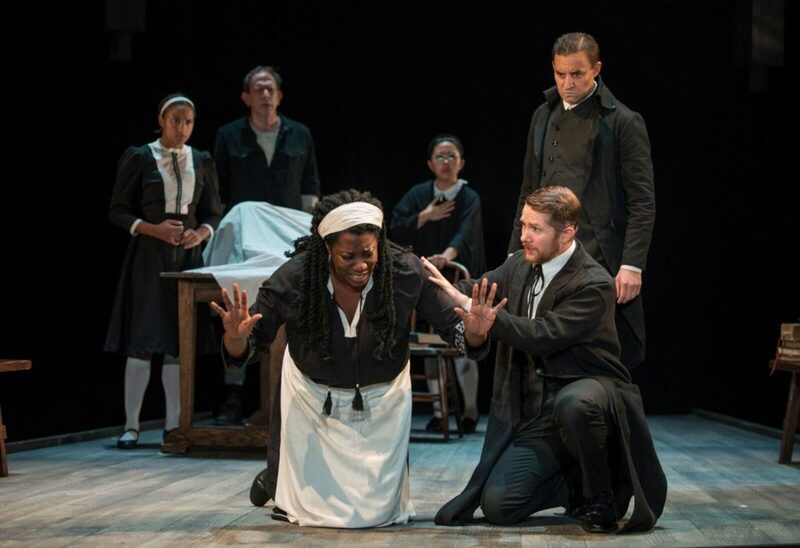 Steppenwolf Theatre for Young Adults presents THE CRUCIBLE. Playwright Arthur Miller’s ode to the 1692 Salem witch trials has eery hints to contemporary issues. Although Miller debuted his play in 1953, loud whispers to 2017 madness are present. The story boils down to using religion to justify killing non-christians. In this case, it’s a group of girls caught dancing by the local minister. Instead of taking responsibility for breaking the church’s strict rules, the girls feign being possessed by evil spirits. They accuse women of being witches and putting spells on them. The teens instigate a mob mentality. Large numbers of citizens are tried, convicted and killed for not confessing to being devil worshipers. The illogical arguments defending the witch hunt are riddled with discrimination and hypocrisy. It feels like listening to political blowhards explaining the reasoning behind defunding Planned Parenthood or sending ‘thoughts and prayers’ to victims’ families of mass shootings. Miller’s ongoing phrase of ‘hard proof’ could easily be subbed with ‘fake news’ to parallel blind self-righteous fanaticism. 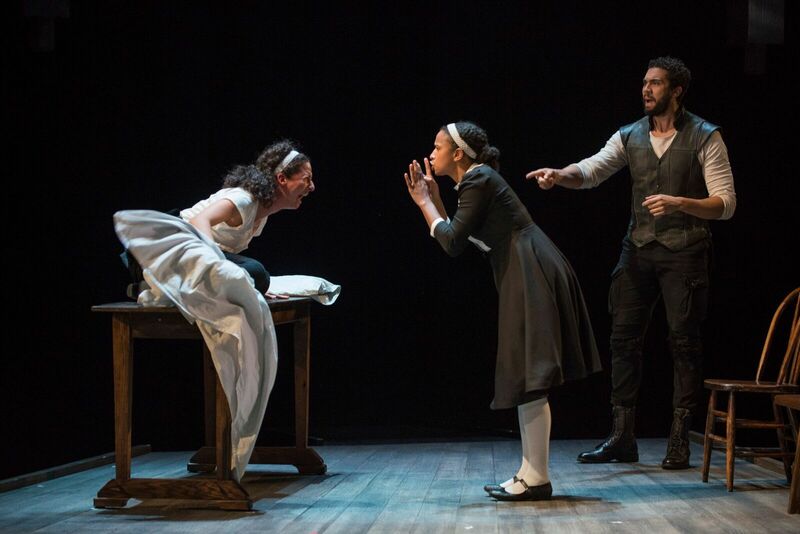 THE CRUCIBLE uncomfortably reflects a modern day insensibility. Director Jonathan Berry captivates the audience immediately. The play starts with the girls dancing in the woods. They move with supernatural synchronicity. Berry contrasts the deliberate, silent flow of the first scene with the flurry of baffled folks in the second scene. Berry’s ensemble plunge us into a town being dismantled by its need to blame others for its fears. A mother’s seven stillborn babies. A wife’s interest in books. Teenage girls dancing. The town wants answers for these unfortunate circumstances. And ultimately, they want resolution to stop bad things from happening. Berry stages this with the ensemble visibly sitting on the sidelines. Many of the actors play multiple parts with the addition of a hat or skirt indicating the switch. Early in the production before the frenzy turns fatal, Berry injects humor with one liners neatly delivered by Larry Baldacci (Giles Corey/Sarah Good) and Millie Hurley (Francis Nurse/Rebecca Nurse). The jabs dripping with sarcasm make fun of the mindless acceptance of God fearing folks. At first, the utterances anchored in religious fervor are too ridiculous to be considered. In particular, John Proctor (played by Travis Knight) refuses to believe his wife, Elizabeth (played by Kristina Valada-Viars) is in danger. Despite Valada-Viars begging Knight to speak up, he dismisses the buffoonery. In a pivotal scene, Erik Hellman (Reverend Hale) questions Knight’s church-going practices. As Knight answers, he begins to realize the case being built against him. Any humor in the lunacy is stripped away, the disconcerting realization leads him and the audience into the upside-down world. The governing authority is not God. It is the loudest-speaking human pontificating on God’s behalf. Berry builds the tension by focusing on the christian crusade of slaughtering innocent people. A fierce Michael Patrick Thornton (Deputy-Governor Danforth) refuses to have his authority questioned. He rules with fear. The people are afraid for their lives as the body count grows. Even in the central relationship between John and Abigail Williams (played by Naïma Hebrail Kidjo), Berry keeps the lust to a minimum. Although Abby’s affair with John is the impetus to her witch-killing-movement, their exchanges have a more political than sensual demeanor. A shrewd Kidjo tries to convince Knight that she is working for a better future for them. An awakened Knight threatens to expose her as a fraud. At this point, Kidjo is driven by power not love. And a remorseful Knight is achingly desperate. He wants his family not his lover back. I enjoyed Berry’s production very much. I couldn’t stop seeing and fearing how lies spoken with conviction can instigate people to do horrible things to their neighbors. 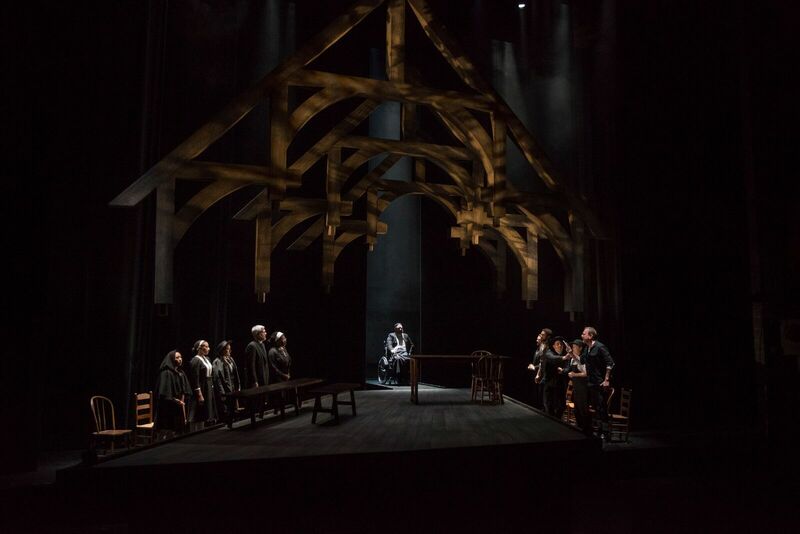 Public performances for The Crucible are Saturday, October 7 at 3pm and 7:30pm; Sunday, October 8 at 3pm; Friday, October 13 at 7:30pm; Saturday, October 14 at 3pm and 7:30pm; and Saturday, October 21 at 3pm and 7:30pm in the Downstairs Theatre.